California or Arizona? Los Angeles or Phoenix? Arizona State University’s W.P. Carey School of Business of USC Marshall Business School? It’s not so easy deciding where you should go to school for your MBA degree. There are many elements to consider including the location, cost of attendance, school rankings, post-graduation opportunities, and type of programs available. To help simplify the process for you, our School vs. School series takes a look at two similar top b-schools to compare and contrast what they offer. Today, we’re taking a look at ASU vs. USC to see which is best for you. Your first thought might be, “Why would I live in Phoenix when I could live in L.A.?” and you wouldn’t be the first to ask the question. The beach versus the desert? We know which one sounds more appealing, but there’s a lot more to the two locations—earthquakes vs. monsoons, hot vs. REALLY hot, affordable vs. not so much. So, how exactly do the two locations stack up when you break it down to the data that matters? It’s not good news for Los Angeles. Cost of Living: Phoenix is 41.9 percent less expensive than Los Angeles. Housing: Phoenix housing costs are 65.8 percent less expensive than L.A.
Education: Phoenix spends 29.4 percent less per student, but the student to teacher ratio is also 21.2 percent lower in Phoenix. Commute: Phoenicians have a 5.5 percent shorter commute than Los Angelenos. Jobs: Future job growth for Phoenix is 48.2 percent versus 34.6 percent for Los Angeles—a 13.6 percent difference. Overall, Phoenix is a far more affordable place to live with housing that costs less than half what it would cost in L.A. However, don’t choose Phoenix just because you expect a shorter commute. Commute times in the two cities are relatively similar. However, when it comes to business school rankings, USC Marshall reigns supreme. Both schools regularly rank in the top 50, but Marshall is in the top 20 for both the U.S. News & World Report and Bloomberg whereas W.P. Carey maxes out at 33rd in the U.S. News & World Report. USC Marshall’s higher ranking also comes with a higher price tag. This is particularly the case when you compare resident tuition at W.P. Carey to USC Marshall. ASU charges Arizona residents almost half ($58,700) what it charges non-residents ($96,500), whereas USC Marshall charges the same ($120,456) no matter what. For the sake of accurate comparisons, we’ll look at non-residents for both schools. When it comes to funding, both schools also offer a range of merit-based scholarships and other award opportunities that include both partial and full-tuition remission. ASU’s mindset is “Scholarships for All” because each MBA applicant is automatically considered for a scholarship. USC Marshall has a similar mindset with no separate application required. It should be no surprise that USC Marshall’s location in Los Angeles also equates to better salaries after graduation for all its MBA students. Marshall MBA graduates can expect to earn more than $30,000 more per year after graduation compared to ASU graduates. However, when it comes to job placement three months after graduation, USC Marshall places 92 percent of students compared to ASU at 95.9 percent. And where those graduates choose to work is very different between schools. ASU MBA graduates tend to prefer technology (31 percent), financial services (18.3 percent), and manufacturing (15.5 percent) with only 5.6 percent choosing the consulting industry. On the other hand, most Marshall MBA graduates choose consulting (30 percent) with just 16 percent choosing technology and the same choosing financial services. In addition, only 1 percent prefer manufacturing at Marshall. Located about 20 miles easy of Phoenix, Arizona, Arizona State University’s W.P. Carey School of Business is regarded as the top business school in the state. Its focus on career services with more than $15 million going toward helping MBA graduates make successful careers. The MBA program also focuses on leadership development and offers seven different degree concentrations: business analytics, consulting, entrepreneurship, finance, information management, marketing, and supply chain management. Full-Time MBA: This 21-month residential full-time MBA program includes a summer internship and classes four to five days a week on campus. Professional Flex MBA: This part-time MBA program allows you to earn your degree in two to four years with classes two nights a week. Online MBA: This 24-month online MBA program offers the ultimate in flexibility with classes offered online or at international locations. Executive MBA: This 21-month Executive MBA program offers classes every other Friday and Saturday. The program focuses on leadership development and includes an Individual Development Plan that you’ll create in your first semester. Seven concurrent degree opportunities are available including degrees in architecture, medicine, finance, and legal studies. Fusion Learning Labs pair non-business ASU master’s degree students with MBA students on action-learning projects. 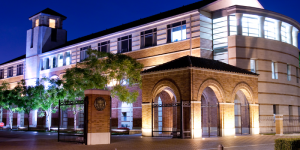 Located in Los Angeles, California, the USC Marshall Business School is one of the top MBA programs in the country, and it was recently the first major business school to achieve gender parity in an MBA class. The school is known for its global reach and entrepreneurial spirit, and offers the same types of MBA programs ASU W.P Carey does. However, the school also offers the internationally-focused IBEAR MBA, one of the few of its kind on the west coast. Full-Time MBA: This 20-month residential full-time MBA program is designed for early career professionals. Executive MBA: The 22-month Executive MBA program is designed for middle to senior-level managers. Part-Time MBA: the 33-month part-time MBA program offers classes on weeknights, weekends, and on two campuses: L.A. and Orange County. IBEAR MBA: This unique, one-year accelerated MBA program is for mid-career professionals. Online MBA: This 21-month online MBA program offers synchronous and asynchronous online classes with a one-week residential intensive. Marshall offers close to 100 elective courses for MBA students in any given year ranging from accounting to economics, marketing, and entrepreneurship. The Global Context of Business course includes a 10-day international trip overseas to visit domestic and multinational institutions. USC Marshall is home to more than 41 graduate student organizations ranging from career clubs to affinity groups and social organizations.